Point your friends to this website by e-mailing this page to them so they can get their free resume too. To download your choice--click save--keep it on Desktop-- with the same file name. When you edit it later you will be able to find it very quickly. For your reference, add our website now. It really depends on what industry you are working in, but on the average, the machine operator will make somewhere around $18.41 per hour. Without any overtime the average yearly wage would be $38,000. Here are 3 machine operator resume formats you most need and should use most to refer to when creating a really nice looking personal resume. They all have a nice format. They are direct and point out your achievements, but don't over state in their design and composition. Your information will be organized just like any HR employee likes it to be. They like resumes to be direct and to the point so they can evaluate you quickly. So that is what you need to accomplish here. When you first glance at it, you want your qualifications and experience to shine. That is what they want so give it to them with confidence with one of these examples. 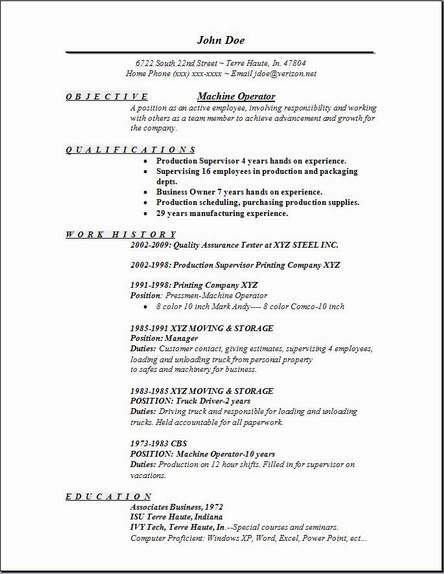 Once you edit this operator resume with information, that's what you will accomplish. 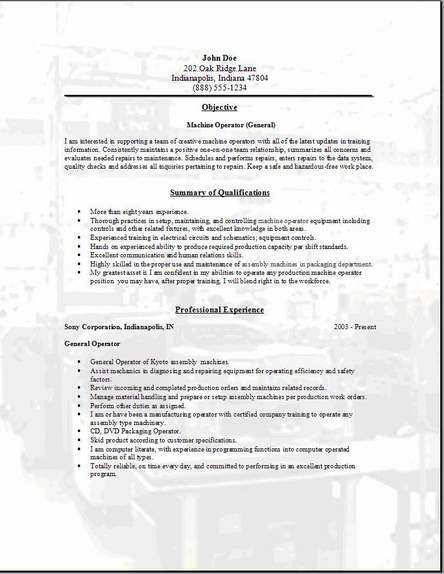 These free operator resume examples are easy and useful. I wish you all the luck in getting the job. Please tell your friends about this website, and send us some comments on the contact us page. Visit lots of other pages to get some more great information. Create a professional summary or objective, that starts with your title first. You want a position as a warehouse worker so write, "Warehouse Worker" right at the very top of the warehouse worker resume objective or summary. Then finish the rest of your objective statement on what you have to offer the employer. I am an extremely efficient, productive team player, well liked among my co-workers and supervisors. With 5 years experience, I will quickly learn your procedures in the warehouse. 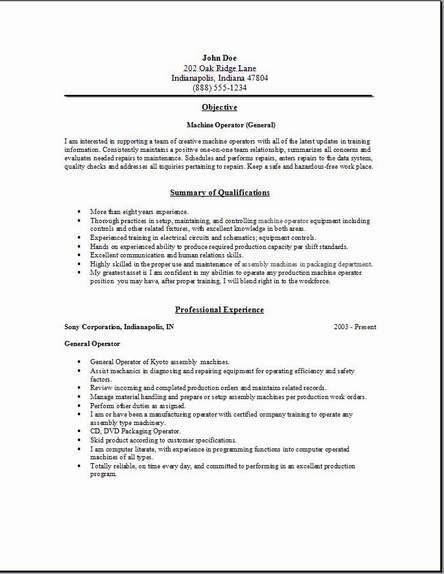 The operator resume template above is a great example, and I hope you like the choice of downloading 3 of the most useful operator resume formats. Chronological or functional, the choice is yours. If you download one of the free templates, you can always experiment with #3 by changing the background pic to one you have on your pc at home. Try it and see what you can achieve yourself. You need to gather all the information you can and put together the strongest possible operator resume so you can get an interview quickly. You can never get enough help so ask your friends what they are doing with their resumes before deciding how to arrange the information you need for your machine operator resume. There is plenty of information on this site and you should be able to come out of here with a great resume created by you. Dig through the information till you find the help. I hope you have great success. Please tell your friends where you found your resume.